Oh my goodness. Blue cheese lovers rejoice. 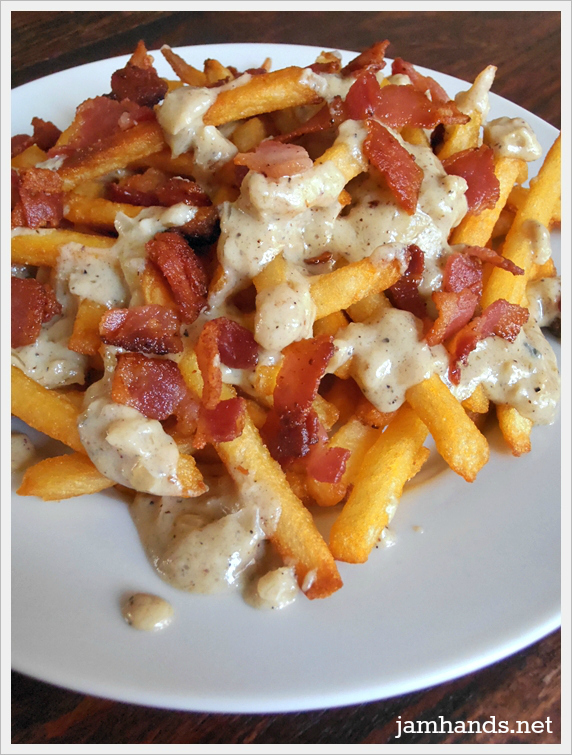 This recipe I found at from Simple Comfort Food is incredibly delicious and comforting. 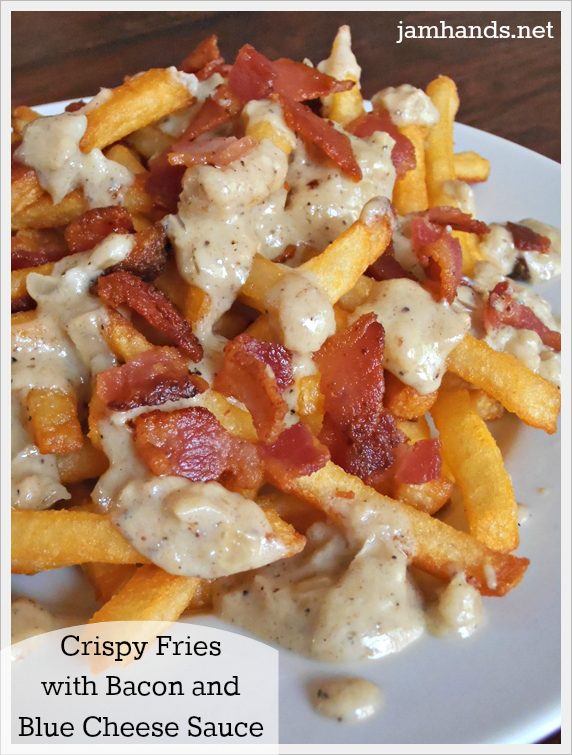 Extra crispy fries are topped with bacon crumbles and a to die for cheese sauce that contains shallots, garlic and lots of blue cheese. If you don't keep shallots on hand, fear not, and substitute regular onions instead. Enjoy! 1. Preheat the oven and bake the french fries as directed on the package for extra crispy french fries. While they are baking, cook the bacon pieces. Drain bacon on paper towels and pour grease out of saute pan. If desired you can leave a very thin layer of bacon grease in the pan to cook with the shallots, garlic and butter, about 1 tsp. worth of bacon grease. 2. Add the shallots, garlic and butter to the pan and cook over medium heat about 4 minutes, watching carefully so that it doesn't burn. You can cook it for longer if you would like the onions to caramelize slightly, which is what I did. Just be careful that the burner isn't too hot or it may burn your shallots and garlic. 3. Add the blue cheese, milk and pepper. Bring to a simmer, stirring frequently, until sauce begins to thicken. For me this took about 5-8 minutes for it to thicken up. 4. 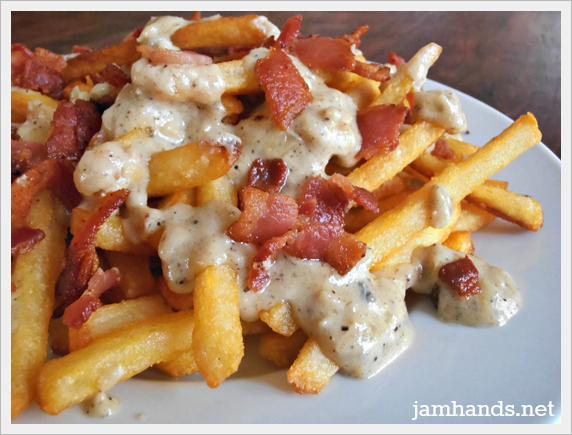 Pour thickened blue cheese sauce over hot french fries and top with crumbled bacon. Recipe from Simple Comfort Food. Sharing this recipe at the following fun link parties. Oh dear. This just may be the death of me. YUM! Oh my goodness, is right! Delicious and I could devour it right now! These look delicious! They remind me of an appetizer I had at a place in Vegas - I've always wanted to make something like them and I think this is it! I've already pinned!! This looks like an after game or late night snack. Looks delish. Thank you for sharing. Oh I am so going to have this soon! I'll let ya know how it turns out! I hope you enjoy it :) Thank you for the comment. Your photographs on your blog are gorgeous. I need you to know that I just literally salivated to such an extent upon viewing this that I choked. I'm not even kidding. This looks insanely, wickedly glorious! I can't wait to make it!